The Mystery of Redemption and Christian Discipleship, 2nd Edition, which consists of seven chapters and an appendix, examines systematically how God redeems fallen humanity. The redemption of Christ is a central truth of our Catholic faith: God assumed our human nature and dwelt among us as a true man; he suffered, died, rose from the dead, and ascended into heaven to save us from sin and to raise us to the status of adopted children of God. The text begins with God’s gratuitous good creation, the exalted dignity and vocation of the human person, the fall of our first parents, the wound introduced into human nature that we call Original Sin, and the promise of a savior. Next, it examines salvation history in the Old Testament as God formed his chosen people in preparation for the coming of the Messiah. Then, the text looks at Jesus Christ, God-made-man, born of the Virgin Mary, in his conception, infancy, youth, and hidden life. Next, it examines Our Lord’s public ministry of preaching and working miracles. The climax of the redemption is recounted in Christ’s Passion, Death, Resurrection, and Ascension. After this, the text looks at how the Church continues the redemptive mission of Christ in the world, especially through the Sacraments as the means that Christ established to convey the fruits of his redemption to all people. The text turns then to the call to Christian discipleship through holiness of life aided by God’s grace and the call to Christian service. The Mystery of Redemption and Christian Discipleship, 2nd Edition, finally considers the role of prayer in the life of every disciple of Christ. The text concludes with an appendix that examines various objections and challenges to the faith with an emphasis on the Christian response to the existence of evil and the value of suffering. 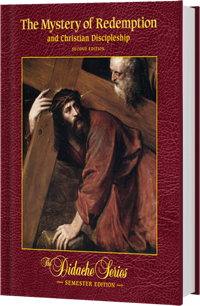 This textbook corresponds to Book III: The Mission of Jesus Christ (The Paschal Mystery) in the curriculum framework. It has been published with ecclesiastical approval from the Archdiocese of Chicago, and it has been granted conformity with the Catechism of the Catholic Church by the USCCB Subcommittee on the Catechism. The textbook is written for high school students and is designed to be completed in one semester.